There's no family-friendly sedan more famous than the 2017 Honda Accord, which doubles down on value with serious cabin space and long-lasting performance. Whether you're planning to spend your mornings navigating rush-hour traffic or ferrying your kids to school, there's a lot to love about the bestselling Accord. Your entire family will love the Accord, which supplies generous head and leg room and much more. The front seats are the perfect place to spend your commute - even if it's a long one. Lateral support and plush cushioning offer the comfort you need to focus entirely on the road ahead. When you crave a little luxury, the Accord delivers with its stylish leather upholstery (check out the Sport Special Edition's unique leather seats with flashy red accent stitching!). Heated seats, both front and rear, are a nice perk, and the ample 15.8 cubic feet of cargo room gives you enough room for what you need. For the latest in technology, there's no better choice than the 2017 Honda Accord. Apple CarPlay and Android Auto features connect your smartphone apps directly onto the central touchscreen, so you can access features like text and call without looking away from the road. When you're dealing with the Accord's central touchscreen, you'll never feel put out. Its intuitive menus make everything easy to find, even if you're new at in-car technology. Driving around in the Accord always feels like a treat. With responsive handling, you'll take on winding roads just as easily as you swing around tight corners. The Accord's agreeable steering makes you feel confident as you make your way through cramped parking garages. Then there's acceleration, which the Accord tackles like a pro, getting you up to speed in a jiffy - even from a full stop. The best news? Even with its impressive power, the Accord manages to earn up to 27 city/36 highway mpg, creating significant savings at the pump. If you want to save even more, it's possible. Check out the Accord Hybrid, which earns an incredible 49/47 mpg. In terms of safety, the 2017 Honda Accord performs well. In government crash tests, it earned a perfect five-star rating for overall protection. The Insurance Institute for Highway Safety gave the Accord its top score of "Good" in every single crash test. In addition, the IIHS gave the Accord's forward collision warning system a rare score of "Superior." This technology doesn't just alert you to an imminent crash - it actually applies the brakes to mitigate damages. The Accord's LaneWatch blind spot camera is unlike anything else on the market. When you employ your turn signal, it displays the passenger-side blind spot on the Accord's central touchscreen, so you can make doubly sure you're switching lanes safely. Take the top-of-the-line Accord Touring for a spin to experience true class. The Touring takes the Accord's family-friendly reputation a step further with cozy heated seats in both rows. The navigation system is also standard equipment, giving you the means to find anything from the next great Italian restaurant to your kids' away games. The Touring's LED headlights increase convenience with automatic high-beam control. When you need the extra light, the high beams automatically turn on. When they sense oncoming traffic, they automatically reduce glare. 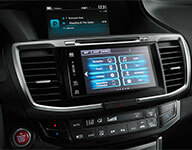 Interact with smartphone apps directly on the Accord's central touchscreen. There's plenty of cargo space for your family's everyday needs. The Accord's generous cabin space is exactly what you need on long trips. The 2017 Accord blows the competition away with swift acceleration and smooth power. When you want all the best this segment has to offer, there's no better choice than the 2017 Honda Accord. The cabin is stylish, with handsome comfortable seats and a neatly arranged center stack, and the Accord's legendary performance and efficiency make it a pleasure to drive.